The report, the latest edition of a study Havas has been conducting every 18 months or so for more than a decade, tracks how meaningful brands are to consumers. The 2019 edition surveyed more than 350,000 consumers about 1,800 brands in 31 countries, and found a significant decline in the percentage of brands that are indispensable to most consumers (see related story). This year's edition also drills into the components of marketing, product, service and corporate social responsibility that contribute to brand meaningfulness, especially brand content. Overall, Havas found that the meaningfulness of brand content is improving: 60% was deemed meaningful this year versus only 58% last year. Maria Garrido, chief insights and analytics officer for Havas Group, says this is an indication that brands and their agencies are rising to the occasion in the face of traditional advertising eroding as consumers move to advertising-free sources of content or install ad blockers. She added that it's important for various industries and brands to understand what kind of content is most meaningful to consumers, noting that many brands might benefit more by providing utility vs. entertainment. 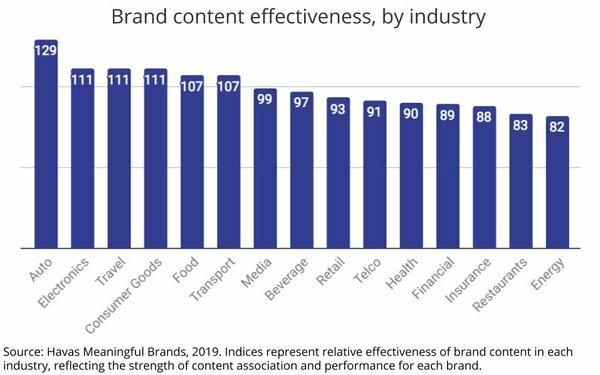 Ironically, the media and entertainment category indexes slightly below the average of all categories in terms of its brand content effectiveness, with an index of 99. After automotive, electronics, travel, consumer goods, food and transportation all performed better than the overall ad industry, while beverages, retail, telcos, health, financial, insurance, restaurants and energy all fell below the average.